Why Do You Want to Do the Show? 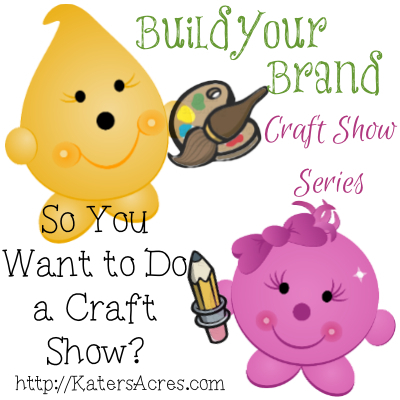 The most important thing that you need to decide in wanting to do a craft show is the WHY question. That’s sounds like an odd question, I know. But the reality is that it is a very hard question for many people to answer. Most people answer the question because they say they want to do the craft show “to make money.” That’s every single vendor’s goal there, to make money. But there has to be more than that to your craft show and your reasons for doing it. One of the reasons that I started doing craft shows in my new hometown when I moved to NW Pennsylvania was to get my name out. I didn’t need to earn even $1.00 at the show, but I took 250 cards and wanted EVERY card gone by the end of the weekend. This was a way for me to meet people, introduce them to polymer clay (which many people didn’t know of or hadn’t seen before), and more importantly it was a chance for me (in my earlier claying years) to test my products and see what people in my area were drawn to or fascinated by. Unless the show is a free show, make sure that you visit the show prior to paying for a table or area. Each and every show is different with a different look, feel, clientelle, and vendors. You’ll be super sorry if you go to a “craft show” that features mostly vintage resellers. You’ll be equally as disappointed if you go to a “craft show” that features mostly artistic paintings and you are a doll clothes maker. None of these are bag things by the way, but it helps to know what you are getting into. It will help you know what you are getting into. Take notes of the following things while you are visiting the show and plan to stay for several hours to get the best feel. Also talk to some of the vendor’s about their past experiences as well. What is the “feel” of the show? Use these measures to get you started: Artistic? Foodie? Vintage? Antiques? Flea Market Style? Juried handcrafts? Does the show operate around a theme, season, or holiday? Is this a show for Christmas gift giving? Is this a show for animal rescue shelters with animal themed crafts? This is the benefit of “hanging out” at the show … high traffic, slow traffic, continuous traffic, crowded, sparse, etc. Do people need to pay to get in? This is important to you! Why? Because people who pay to get in are going to expect higher quality and often be willing to pay more for their goods. If the show is free, people generally come with fewer expectations and want to spend less as well. Does the show have 20 vendors or 200? This does matter because shows with more vendors mean you generally have ONE SHOT to grab people’s attention and make them want to return. Shows with fewer vendors, people will often visit your table more than once as they make their “rounds” through the show. This might seem a little obvious, but it’s frightening how often this one thing is overlooked. You need to check your calendar and mark the date for your show a year or several months ahead of time. Why? So you can properly prepare for a craft show. Next week I will walk you through a timeline of things that you need to accomplish in preparing for your next craft show. Join me next week to Build Your Brand on Etsy & experience success. Oh, I thought of another reason….meeting people and networking with other artists! That’s really important! Most crafters are very generous with information about shows to try and ones to avoid. Of course, you also have to keep in mind that everything is relative….what may be a good show for one vendor could be bad for another. Plus, everyone’s idea of ‘good’ is different. But getting information about the crowds, the type of show it is, how the promoter advertises and how they work with/treat their vendors is all universal information. I love the idea of this series, Katie! As a 23 year veteran of craft shows, I understand exactly what you are saying here! DO YOUR HOMEWORK! So many shows these day advertise themselves as CRAFT shows, and then about 1/3 of the booths are filled with commercial, home-based businesses, or even worse, MADE IN CHINA crafts! Another thing to pay attention to prior to booking a show is how the promoter advertises for it. I’m much more willing to pay a higher fee to get into a show if I know that a big portion of my dollars is going to getting a great crowd at the show. I also had to chuckle when you asked everyone to decide WHY? It seemed obvious, but of course it’s not! I go with the intention of making money, BUT equally important is to just get people’s eyes on my work and to get the word out about who I am and what I do and where they can contact me in the future. Another good tip is to have a schedule of your upcoming shows and events to hand out. I look forward to reading the rest of your series! Craft shows and art fairs are my bread and butter, so it is interesting to hear how others work to prepare for them. I can always learn something new! Thank you for this article, Katie! I have done a few shows in the past and like you say, it is always a good thing to check them out before you go there as a vendor. Our biggest ‘mistake’ was our first show ever…. We (my cousin and I) had been there before just to look and we thought it would be great to go there with our ‘stuff’. But boy-oh-boy, we’re we unprepared!! It sure was a great learning curve but it was WAY too big for a beginner. Another thing I like to point out, if you go to the same show and don’t sell a lot the 2nd (or 3rd) year, just let that one go because it might not be the right show/public for your creations. Great tips Astrid – thank you!